Powers/Abilities: The Saint of Killers employs two guns which always strike their target and always kill them, no matter how difficult the shot, or how tough the person shot. He cannot be killed by any conventional means. 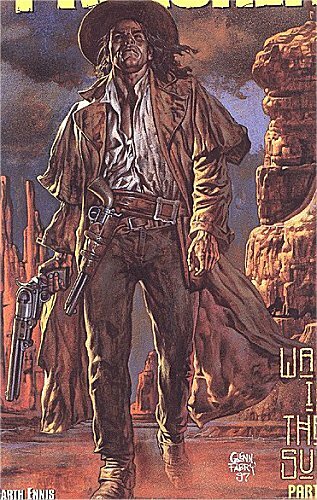 History: The Saint of Killers was once a heartless murderer who made his living in the American West by collecting scalps and killing for money. His life changed when he found a young girl that he had inadvertantly rescued when he killed her indian captors. As they were far from civilisation when they met, the girl pleaded with him to take her with him, and in spite of himself, she got through his bitter, hardened exterior, to whatever tiny core of goodness rested within. They fell in love, married, and had a daughter, and the killer became a farmer. However his family fell ill, and the man left them to fetch the doctor from the nearest town. When he got there his mission was delayed by a gang of outlaws whom he got into a fight with. As a result of the time this wasted, by the time he returned home he found his family had died. Grief stricken, he returned to the town and went on a killing spree, hunting down each of the gang members until all bar the leader were dead. The leader took a girl hostage, but the gunslinger shot her too, damning himself. Just before he could shoot the leader of the outlaws, he was impaled in the chest with a shovel. Death took him, and because of his last murders, he was consigned to Hell. His hatred could not be contained though, and it caused Hell to freeze over. The Angel of Death was in Hell, playing cards with the Devil, and he suggested a solution. They would allow the man to return to Earth to finish his vengeance so long as he would then agree to become the new Angel of Death. Accepting the offer, the new Saint of Killers slew the Devil for insulting him, and then returned to the land of the living, where he slaughtered everyone in the town. Viewing him as dangerously uncontrollable, Heaven arranged to put him to sleep except when he was needed to kill people. When Genesis escaped Heaven and merged with the Preacher Jesse Custer, the Saint was awoken again, and sent after Custer. For the first time ever he was stymied when Custer used his vocal powers to prevent the Saint from shooting him or his companions. However the Saint kept coming back, and it was only when Custer offered him information about why his family died, that the Saint stopped gunning for him. Jesse informed the Saint that it appeared the deaths were not accidental; Heaven had arranged them in order to obtain themselves the services of an efficient killer. Now the Saint has a new target - Heaven itself. Thanks to "ComicBookKing" for correcting me on the manner of his death, and to "Jim Bob Bob Jim" for clarifying his targets during his last pre-death killing spree. St.George, a hero who hunts monsters while wearing a tuxedo and medieval helmet.